The Ridge was used during the Great War for TNT and cordite storage and vacated in 1922. Changing little between the wars, Ridge was requisitioned by the War Office in 1934 and brought into commission in 1936. Although earmarked as part of CAD Corsham, it was used by the RAF. 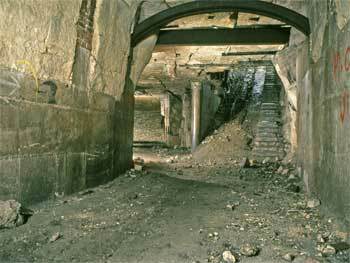 The RAF left Ridge Quarry in 1955 and the Army kept a presence there until 1964 after which the site reverted to care and maintenance under the Ministry of Works and Building. Ridge Quarry was repurchased by the Neston Estate in 1975. Click on the button above to see Ridge Quarry. A view looking up No 2 Slope Shaft taken from the haulageway. Note the surviving steel arched roof support.